Having gone through this experience, I would highly encourage you to apply for any award that is offered by TARGETjobs as the whole process is challenging but rewarding! My name is Osman Salam and I was a second-year undergraduate in business and management at Aston University. I remember rummaging through my emails and seeing an email from TARGETjobs about the ʼMale Undergraduate of the Yearʼ awards. My initial reaction was ‘I’m not good enough to get through the process so I’ll delete the email.’ However, as I was about to click the delete button, I envisaged myself getting past the first stage and being invited to L’Oréal HQ in London, so I decided that I was going to apply. To my surprise, while I was at university with friends, I got an email saying that I was through to the next stage and I was required to complete some psychometric tests. I just remember the rush of emotions flowing through my body: excitement, as I was one step away from going to L’Oréal HQ, and nerves, as we all know how daunting psychometric tests can be. This is where I had to get my game face on and make sure I completed these tests to the best of my ability, which I did. L’Oréal took charge of selecting the best candidates. After responding to further assessment questions and speaking to them over the phone, I made the cut and was invited to the assessment centre in London. On the day, I remember feeling like I was on cloud nine as I was about to be the first member of my family to get the opportunity to work in London, but also being very high on adrenaline as I hadn’t slept the night before! I was feeling the pressure as I knew that the 40 male undergraduates from all across the UK were exceptionally bright and talented so I had to make sure I raised my game on this day. From 9.00 am up until lunchtime, we undertook three different assessments, starting with numerical and attention to detail tests. We were then asked to present a case study we had to prepare, which was a 20-minute pitch for the new product range of one of L’Oréal’s brands. Just before lunch we prepared and presented a group project, pitching marketing strategies for the launch of a product. It was quite a nerve-wracking moment when the talent acquisition team announced the names of the candidates who had met the benchmark and were through to the final in the afternoon. I vividly remember thinking I hadn’t gone through as my name was called out and the group I was in was required to leave the room – I thought my time was over, but it had been a blast meeting great people and despite everyone competing against each other, there was no friction between all 40 of us at any point! As I was sitting in the waiting room for my turn to do the final one-hour interview, I thought that no matter what happened next, I was proud of being part of the top 20 Male Undergraduates in the UK. Once the interview was over, we all mingled with each other as well as speaking to some of the current L’Oréal employees, which was a fantastic way for us to truly understand what its like to work for this amazing company! For anyone planning to apply for placements or internships soon, my greatest piece of advice is to BELIEVE IN YOURSELF. It sounds very clichéd, but honestly as an introvert myself, this was very hard for me to do and I had to break the wall I surrounded myself with when I was in that assessment centre – I wasn’t there by luck. Whatever internships or placement opportunities you decide to pursue, believe in yourself and you will get the right opportunity! Another piece of advice for any placement or internship opportunity you pursue is to make sure you do a lot of background research into the company you apply for. This may seem daunting, especially with revision and exam pressures, but the time you invest in those few months applying for placements and internships will pay off! Coming back to the Awards, I left the assessment centre final with a great feeling, not because I managed to answer every question of the final interview perfectly, but because I was interviewed by the head of talent acquisition and I managed to really show off my personal achievements, which alleviated any initial worries I had about the final interview. Going back to Birmingham with a wealth of experience and getting the opportunity to visit L’Oréal HQ was invaluable to me and it made my family very jealous – especially as I have four sisters who all use L’Oréal products. I felt very proud of being able to say I was a part of this experience. After the assessment centre, I was constantly looking at my emails, eagerly awaiting the outcome to see whether I had made it to the top ten. Then, while I was in a restaurant in Hull visiting a friend, I decided to take a look at my emails and there it was: an email from L’Oréal HR and I froze! ’Do I open this now or do I open this email when I am on my own?’ – the question whirled around in my head for a good five minutes. Being encouraged by my friends to open it while in the restaurant, I did and there it was: I had officially been offered a 12 month placement at L’Oréal! I celebrated like I was at a football game and my team had scored. This is when I knew I had achieved something amazing. I was so sure I would find out on the day of the awards, which was in a few weeks’ time, but I had already got my confirmation. I had to ring my family and wake them all up from their sleep to tell them the good news, which I have now been forgiven for! So off I went. My destination: Canary Wharf in London, where I would sit on the L’Oréal table as one of the top ten Male Undergraduates of 2018. The venue was exquisite, the sun was shining and TARGETjobs had organised a stunning ceremony as well as serving a delicious three-course meal. I was in awe to have been able to sit amongst department executives as well as the top ten Male Undergraduates in the UK. Also sitting on our table were some current interns, who gave us an overview of the projects they were working on. This really excited me, and I was even more excited to know who the winner was going to be. When the moment came, I tried to stay as calm as I could but my heart was running faster than the Road Runner out of Looney Tunes! Despite not winning the award, I was exceptionally proud of myself for getting this far and beating off stiff competition along the way. 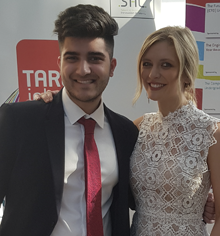 As Rachel Riley mentioned in her speech prior to announcing the winner, we should have been immensely proud of sitting where we were. Thinking that I was amongst the top ten Male Undergraduates of the UK and the only one from Aston University, I felt like a million feet tall. So, here’s to this opportunity that I was so nervous to apply for, thinking it was out of my reach to get a placement at L’Oréal. If you are reading this and thinking whether to apply or not: just apply! You could be the winner of this amazing award and bag yourself an amazing placement or internship at any of the amazing companies that sponsor these awards. This experience showed me a side to me that I thought I never had before, as well as showing me that in life nothing is impossible! Currently being in my third month at L’Oréal and working in the active cosmetics division in category management, I have had so much exposure to the world of cosmetics as well as being given the responsibility and freedom to truly express myself in this job. I have done vast things at L’Oréal from reporting to the CEO on my findings to getting involved in community activities, which just shows you how diverse L’Oréal is as a company and that not everything is always about work, work, work!